Discover our smooth Flat White for a creamy-tasting coffee break in the comfort of your own home, and fall for its delicious, velvety notes. Our talented coffee creators have skilfully prepared the smooth milk, which is carefully combined with a shot of espresso to make a classic velvety and smooth Flat White. 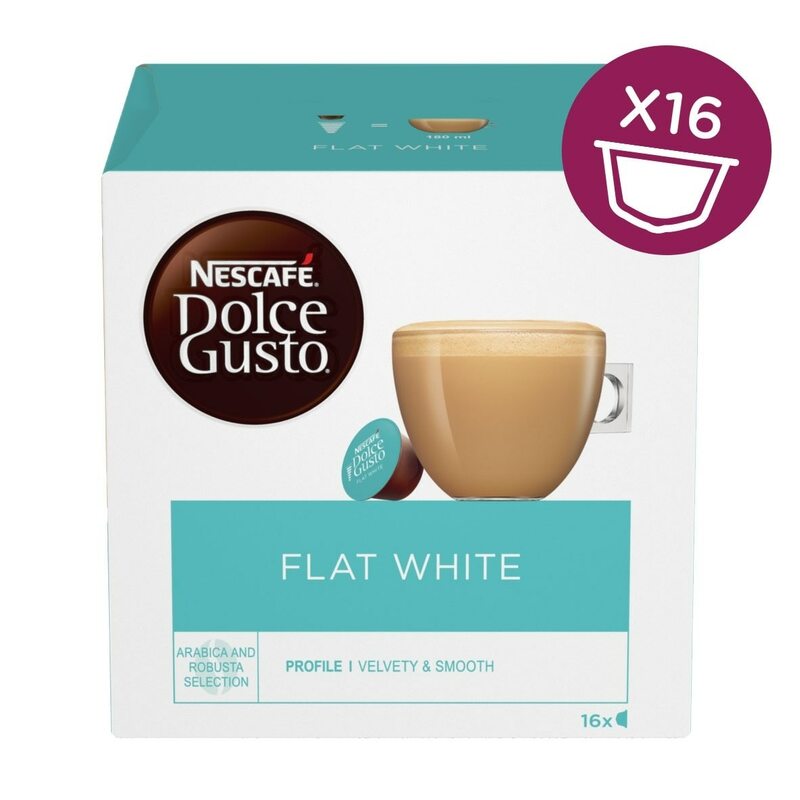 Simply slide your Flat White capsule into your NESCAFÉ® Dolce Gusto® machine. Your coffee will be ready right away. The box contains 16 capsules of NESCAFÉ® Dolce Gusto® Flat White, designed for NESCAFÉ ® Dolce Gusto® capsule coffee machines. Whole Milk Powder (74%), Soluble Coffee (14%), Sugar (13%), Stabilisers (Dipotassium Phosphate and Trisodium Citrate), Emulsifier (Soya Lecithin). Disappointed as there is very little taste of actual coffee. Looks good but in my opinion tastes of sweetened hot milk. 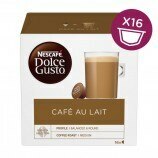 Not a great fan of strong coffee but could do with a bit more in this case without sugar. Please! I like the fact that its sweetened but it is too weak and too small a serving. I'm adding more coffee but kind of defeats the object. Flat white is my favorite coffee at the moment as this is far too weak. Unless you like sweetened coffee, you'll be disappointed by these capsules. I fail to understand why the customer can't be left to sweeten their own coffee. It means I've stupidly paid several quid for a box of capsules, the remaining 15 of which are undrinkable. Lesson learned: I'll read the ingredients list before I buy. I'll stick to the cafe au lait. Flat White is one of my favourites. Hope you will produce a magnum one soon? This product is just too sweet, if you do not take sugar it tastes disgusting....why not let people sweeten drinks themselves?? Very disappointed. First pod I have not liked not liked. Just an unplesant taste of synthetic milk/creamer overwhelms any coffee taste.